Sleeping with Zebras in Zambia. Choosing a hotel from which to experience the thrill of the Victoria Falls on the Zambezi river is straight-forward. You must choose between the Zimbabwe side or the Zambia side. My research led me to the Zambian side. I felt the tourist infrastructure would enhance our short visit. At the time of our visit, the Zimbabwe side was reeling from controversial elections and an unstable economy. I have a high value for hotels with the best locations and amenities, for the dollar. The Royal Livingstone was at the top of the scale for location and unique amenities, it was also at the top of the dollar scale. A trip to Africa, for most travelers is not a common thing and one can hopefully choose some extravagances wisely. 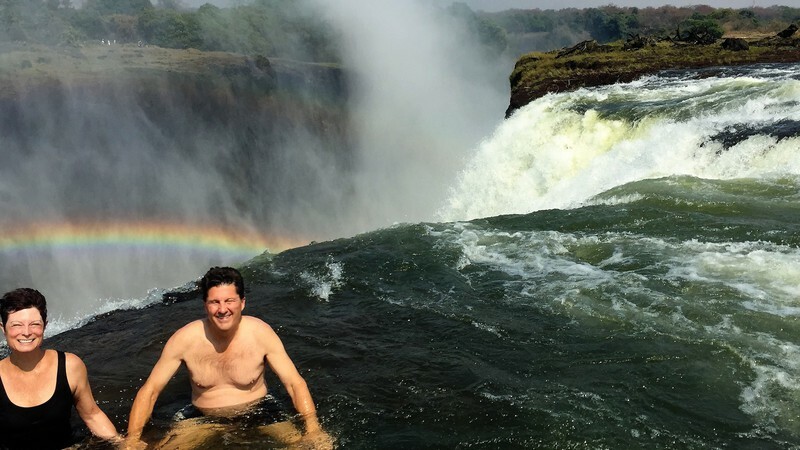 If you value your time in Victoria Falls, you may come to the same conclusion as I did. 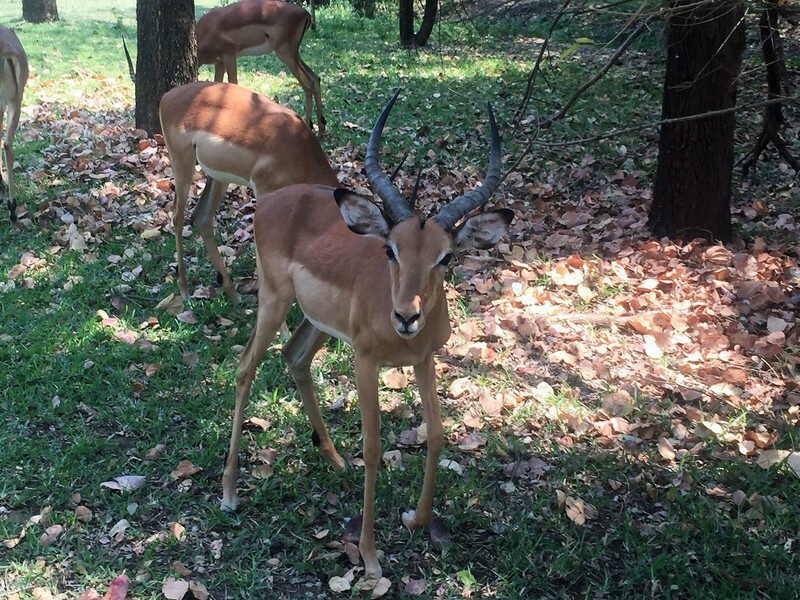 The Royal Livingstone Hotel is worth it! We had arranged, in advance, for a pickup at the Harry Mwanga Nkumbula International Airport through the hotel. This is highly recommended, as there is no guarantee that there will be enough taxis for all the passengers arriving at the same time as you. If you choose to book a shuttle, know that you may have a long wait for all passengers to load the van, and several stops before your hotel. We knew we would be anxious to arrive at the hotel and booked a private transfer. As we arrived, we witnessed an intensely red sun, bleeding into the river, just beyond our guest room. 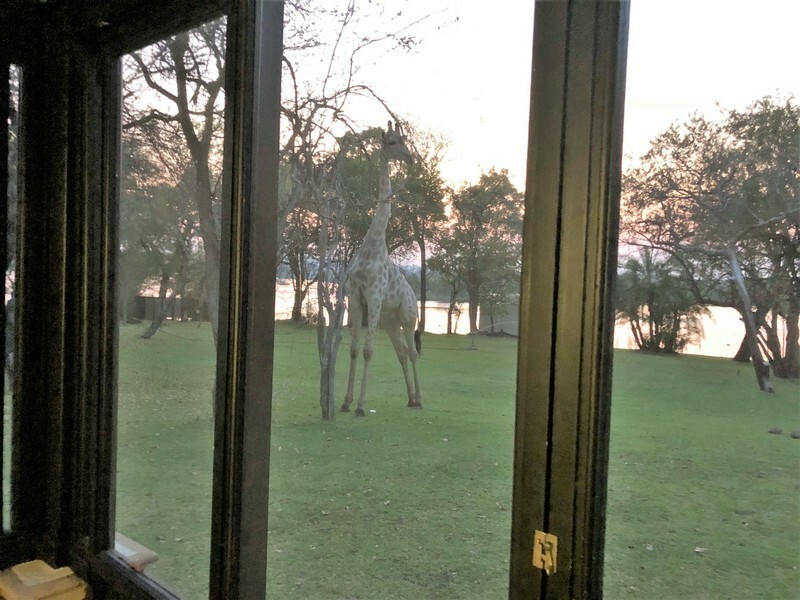 As romantic and delightful as this was, it was nothing compared to the thrill of being greeted at our room by two full-grown giraffes, enjoying their “happy hour”. The promise of seeing giraffe, zebras, impalas and monkeys on the grounds was the most influential in our choosing this hotel. I mean really, who could pass up on that possibility? I was struck by the contrast of natural wildlife and an ultra-civilized colonial manor-style lodge. The style of service is quite formal; from the individual greeting and check-in to the main bar where cocktail service is conducted from a rolling cart accompanied by a pianist. Clearly the goal is to treat every guest as a VIP, even if the execution was not always successful. It was well-passed sundown when I had my first “sundowner” of a Pink Gin cocktail (Gin, tonic and bitters), it was very refreshing. The common areas are all open-air, which is a bit surprising since there is a high incidence of malaria in Zambia and Zimbabwe. The hotel does provide insect repellant and it is highly encouraged that you use it. You should also consider planning for your malaria prevention prescription well before you head to this African destination, and start taking them before arriving. Regardless of mosquitoes, the common areas are buzzing with hotel guests, the sound of water features and live instrumental entertainment. RLH is a member of the Anantara luxury resort properties. I highly recommend signing up for their loyalty program before booking. Sign up for their deal emails, and you will probably find a good rate and gain points toward future stays around the world. We were fortunate to receive an upgrade to a deluxe corner room. Room amenities included a large, spacious bath, comfortable furnishings, a powerful air conditioner and even a bouquet of roses. This ground-level room with a large, screened patio, looking on to the Zambezi river allows for more opportunity to view the wildlife. And boy, did we ever enjoy giraffes, impalas and zebras just living life just outside our room. We had the most interaction with the Zebras (pronounced zɛbrə, not ˈziːbrə, in Southern Africa). There are two rival families on the property. When I say “interaction”, I mean up-close observation. We would never touch the wild animals, they were tame enough and would approach us, certainly comfortable with humans. Their markings are mesmerizing. One evening the family with a six-month-old baby just hung out by us as we enjoyed a glass of wine on the lawn among them by the river. Late one night I fell asleep on the sofa on the screen porch and was awakened at midnight by strange sounds. 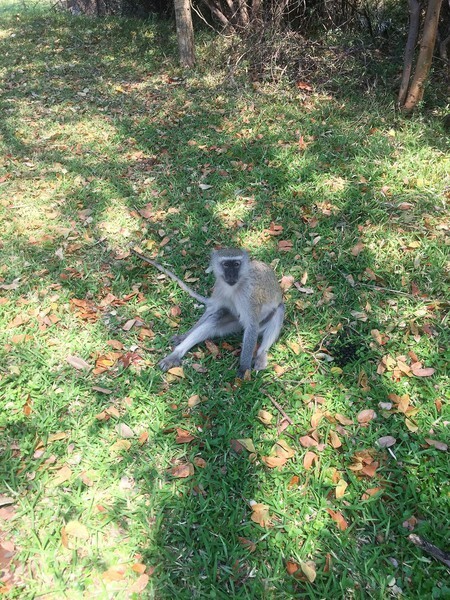 At first, I thought it might be baboons, that would be a nightmare, they are so aggressive and nasty. When I could focus in the darkness, I could see several zebras curled up (like large dogs) on the lawn, just munching away on the grass. After that, I was too excited to sleep. 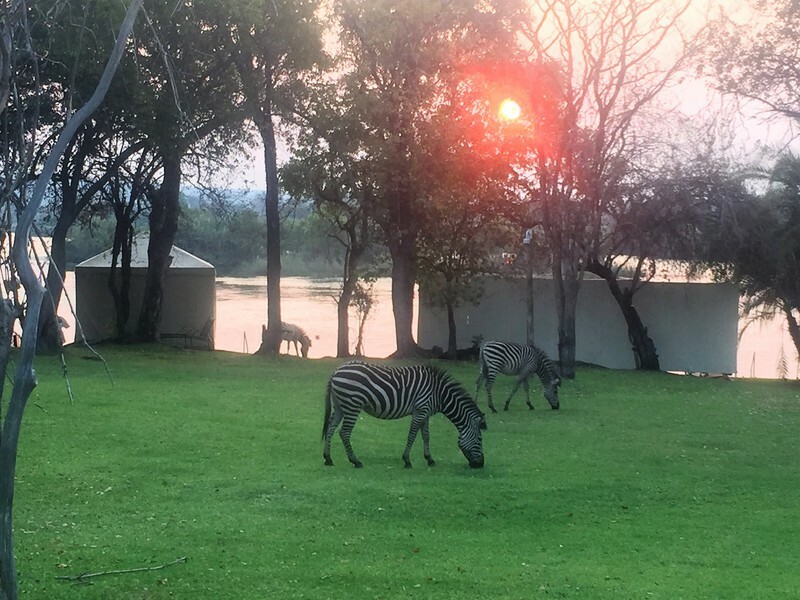 The Royal Livingstone Hotel has a location right on the Zambezi river at the mouth of Victoria Falls, in Mosi-oa-Tunya National Park. Guests have unlimited access to the Falls entrance on the Zambian side. 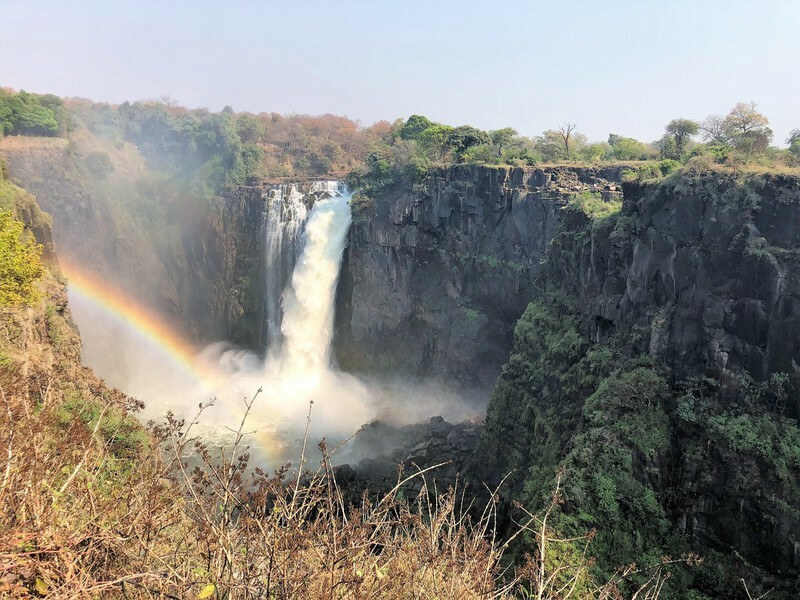 Clearly, you are here to visit one of the seven great wonders of the world, the Victoria Falls. 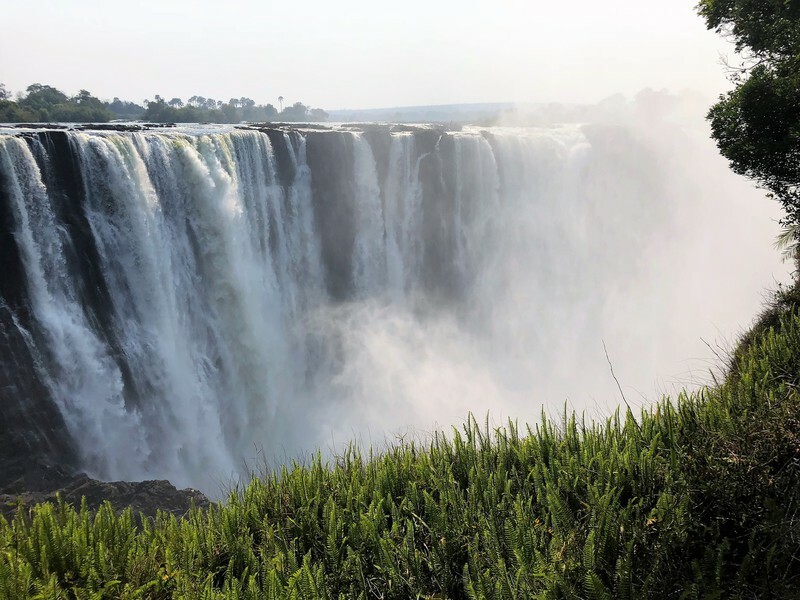 The best view of the large expanse of the falls is from the Zimbabwe side. 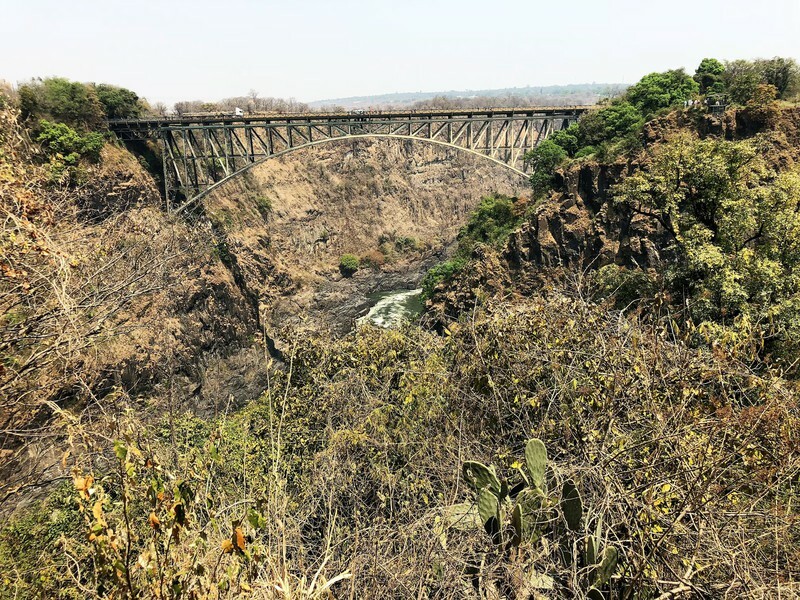 You can walk to the main entrance gate by crossing the bridge over the Zambezi river and take a self-guided walk of the well-marked path. I recommend booking a professional guide, you will benefit from their extensive knowledge and maybe avoid some of the crowds too. Booking the tour from your hotel will allow you to pass through customs more easily, as it can be a very long process, depending on the time of day. The professional guides have a protocol to pass you from one vehicle on one side of customs to another vehicle on the other side. You must be sure to purchase the KAZA Visa at the airport, in order to travel to the other side. We were pleased that the time of our trip (September) would allow us to swim in the Devil’s Pool on the Zambian side. This can only be done when the water flow is below a certain level. If you book this adventure, you will be picked up at the dock at the hotel for a short ride to Livingstone Island, passing a few resting hippos on the way. The Island is set up just for this excursion. Guides meet you and take your meal order, you may change into swimwear before starting your swim to this naturally-occurring infinity pool. There was nothing in the “brochure” that prepared me for the thrill of this experience. Let me try to prepare you- this would never be allowed in the U.S. for the shear danger of it. You will need to be a strong and confident swimmer to cross the current to each of the stops on the way to the pool. Your time in the water will be about an hour, fortunately, the temperature was nice and warm. The beauty of the excursion is that they only allow for eight people at a time at the pool, You and your travel companion will have at least 5 minutes all to yourselves, and that will be more than enough time. Don’t worry about taking pictures, you will be focused on staying on the right side of the 300-foot drop of the falls. However, one of the guides will have your phone and will record your entire time in the pool. Your guides are competent and trustworthy but do know you are the only one responsible for your safety, take it seriously. The extensive breakfast buffet was included with our room rate and it was a great way to start each day. The main dining room is The Royal Livingstone Dining room which is your primary option on the property. You may also have a casual meal in the Lounge or in your guest room. We made the acquaintance of the on-site sommelier Lucky Nkhazi and chatted him up about the wine program and his education. He has pursued training at his own expense by traveling to Cape Town to complete the WSET program. He has become involved in the blending of the exclusive Royal Livingstone wines. You will find a great selection of South Africa’s best producers on the list. Lucky will be happy to help you pair wines by-the-bottle or by-the-glass with your selection of exotic (well, at least to us) game specialties. Other dining options include a short walk or cart ride to the sister property Avani Victoria Falls. This property has the same excellent location with a lower price and a family atmosphere. The main restaurant there offers a buffet or menu service. It is good choice for lunch, as you can enjoy wood-fired pizza by the pool with a cold bottle of Chenin Blanc. Between the two properties is a Boma which serves an authentic outdoor African meal on Tuesdays and Fridays. The most unique dining option would be to book dinner on the Royal Livingstone Express. This restored steam locomotive will take you on a five-course journey for sunset, falls and wildlife viewing. Offered Mondays, Wednesday and Saturday. Please consider booking your excursions well in-advance. 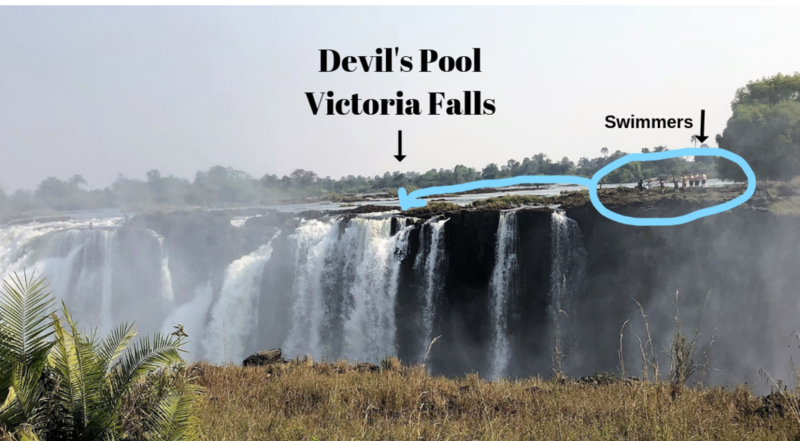 Many will be fully booked by the time you arrive, especially the Devil’s Pool. The on-site tour company is Bushtracks. They are a first-class operation with a long history with the hotel. If you are arriving during the high-water season, you might consider a helicopter tour. This will allow you to get above the thick spray and get a spectacular view of the falls and the surrounding terrain. You can arrive or depart to the airport in style, on a water taxi. There are river cruises and safari day trips too. I did not receive any compensation for this article. It is the honest expression of my experience. I hope it was useful to you. Remember to always do your own research to determine what is best for you.